We’d love your help. 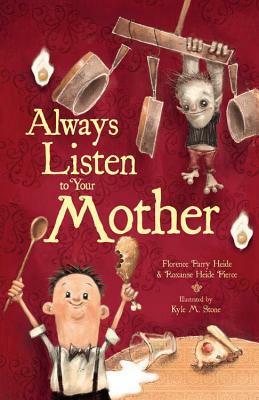 Let us know what’s wrong with this preview of Always Listen to Your Mother by Florence Parry Heide. Ernest always does what his mother asks...and never has any fun. When a new boy moves in next door, Ernest's mother encourages her son to make friends. But the new neighbors seem a little bit...strange--monstrous, even. Obeying Ernest's new friend Vlapid's mother means Ernest must do things he'd never dare try at home. And it's fantastic! Veteran children's book author Florence Parry Heide and her daughter Roxanne Heide team up with Kyle M. Stone to create a gleefully subversive take on the traditional new neighbor story. Lots of energy and mayhem, and a cool gothic approach to the illustrations make this a great choice for Halloween and all year round. To ask other readers questions about Always Listen to Your Mother, please sign up. Creepy little story about a lonely little boy whose controlling, clean freak mother allows him to play with the ghoulish new neighbor boy because he always listens to his mother. They have fun trashing the place. The illustrations are very effective and I would have given it another star had it been a little longer. It seemed to stop abruptly. I discovered this book while shopping for presents for our girls during a business trip. The title certainly caught my eye and the cover illustrations were intriguing. The story is certainly entertaining and has an underlying nuance of the little boy being naughty without technically disobeying. Ernest is such a straight-laced little boy that it was quite humorous to see him let loose and discover his wild side. The illustrations are entertaining and quite creepy, too. I love that Ernest's mothe I discovered this book while shopping for presents for our girls during a business trip. The title certainly caught my eye and the cover illustrations were intriguing. The story is certainly entertaining and has an underlying nuance of the little boy being naughty without technically disobeying. Ernest is such a straight-laced little boy that it was quite humorous to see him let loose and discover his wild side. The illustrations are entertaining and quite creepy, too. I love that Ernest's mother encourages his friendship with his odd neighbors despite their differences. Although I think perhaps that she was just completely unaware of the strange nature of the house and family, and in that case, I would consider her behavior somewhat neglectful. Delightful! Ernest is a very good boy who always listens to his mother, although it is a little boring to be so good and helpful all the time. But, when a rather...unusual... family moves in next door and Ernest goes to meet the little boy, it seems like adventures and fun are finally at hand. I won't say more because I think the fun and cleverness in the book, and what made it work for me, is in how the authors managed to let Ernest have fun in new ways, to have his little monster friend be aut Delightful! Ernest is a very good boy who always listens to his mother, although it is a little boring to be so good and helpful all the time. But, when a rather...unusual... family moves in next door and Ernest goes to meet the little boy, it seems like adventures and fun are finally at hand. I won't say more because I think the fun and cleverness in the book, and what made it work for me, is in how the authors managed to let Ernest have fun in new ways, to have his little monster friend be authentically "monstrous" while also "good" -- and all this without totally disregarding their mothers' wishes. This could have been a bit disastrous in the "message" for kids, but I think it was handled well. Some parents may wish to have a discussion with their children about when it is okay to do something different than they would do at home if it is permissible at a friend's house, but also that there are some rules that should never be broken, no matter where. Ernest always listen to his mother and being that she is a good mother she keeps the house clean and allows Ernest to play with the new boy in the neighborhood. But there is a twist. Although the neighbor boy is a good influence because he always listen to his mother, things are not quite what they seem. Interesting illustrations, possibly a little creepy. Ernest is a young boy who always does what his mother says. Will anything change when a new boy moves in next door? Ernest is a good little boy always listening to his mother. He eats his brocolli, goes to bed on time, and never whines, dwadles or talks back. He helps his mother with the housework. His life is quite ordinary and dull. Until a new family moves in, a vampirish, ghoulish type of family. Vlapid the new little boy also does everything his mother says, but is entirely opposite of what Ernest knows. They swing on chandeliers and write on walls. Ernest's mom says he can play with Vlapid everyday, not Ernest is a good little boy always listening to his mother. He eats his brocolli, goes to bed on time, and never whines, dwadles or talks back. He helps his mother with the housework. His life is quite ordinary and dull. Until a new family moves in, a vampirish, ghoulish type of family. Vlapid the new little boy also does everything his mother says, but is entirely opposite of what Ernest knows. They swing on chandeliers and write on walls. Ernest's mom says he can play with Vlapid everyday, not knowing the type of play they really do. The story has a great setup of the two characters and the conflict that could arise when Ernest's mom finds out what the new family's rules of the house are. However Ernest's mom never does, hence the second half of the book was a let down. Kind of felt like only half a book. The illustrations are wonderful and does a good job of changing the color palette between Ernest and Vlapid's home. I liked the artist's rendering of Ernest as a boy from the 50's with starched white shirt, black trousers, suspenders, and a bow tie. He kind of looked like the hired help, hence evoking my sympathy. I liked this book in a strange sort of way. The main character follows all of his mother's directions. Good mothers do this and good children do that. Then the boy visits a new neighbor who also follows all of his mother's directions. But there is a slight twist. A fun book with great illustrations. The illustrations are the key to this somewhat weird book. If you are to read it without looking at the illustrations it would not make much sense. It does follow the trend of well known authors collaborating with their children. I knew I recognized the illustrations style, but not until I read the flap and found he illustrated my favorite J. Patrick Lewis' Please Bury Me in the Library. If the writing has been as fantastic as the illustrations this would have been a 5 star book. Cute story but the pictures were the best part. Oh, I thought this sounded good to read to my children, but then I there is a big turn in the story. A strange little book, but I kind of liked it. It's a little long, and the illustrations are a little dark. Not bad, but... no recommended when others out there are favored. Heide, F. (2010). Always listen to your mother. New York: Hyperion Books. It was a story about a boy named Earnest that always listened to his mother. He helped her cook and clean and he always asked permission to do things. Finally a new family moved in next door and he asked his mother if he could go meet them. They went over there and the mother had a cleaning list too, but it just said the room names. Earnest and his new friend played all day and had lots of fun. When Earnest came home he to Heide, F. (2010). Always listen to your mother. New York: Hyperion Books. I really liked this in the beginning. The drawings are cool, the kid is terrific, and storyline is clever. But I was disappointed in the last half of the book, and I didn't really even understand the last spread. They were fishing? That's bad? I expected more monster-ish behavior from Vladip, and more to the story. It felt like the author started with a great idea, then just got tired of it and wrapped it up before it reached its potential. Ernest is a very good little boy who always listens to his mother. Vlapid is a very good little boy who always listens to his mother. When Vlapid moves into the house next to Ernest, things get way more interesting for Ernest! My six year old was slightly freaked out about the boys’ antics, expecting they would get in trouble, but at the end he got the joke and laughed for quite a while. Just picked this up off the Halloween shelf at the library. If you liked Peter Brown's CHILDREN MAKE TERRIBLE PETS you will like this. It has the same type of tongue and cheek humor and fun illustrations. Illustrations were kind of creepy and I didn't like that when he "disobeyed" his own mother's instructions in another kid's home, it was totally acceptable because her rules were much less strict. I think this sends a bad message to kids. Loved this one. It shows two boys and two moms. Both boys listen to their moms with wildly different results since one mom keeps the house ridiculously clean and the other loves chaos. Quite humorous. I absolutely love the illustrations in this book. Even after I read it a few times, I continued flipping through the pages just to look at the pictures. The mixed media and collage style is a lot of fun with some Victorian and art nouveau aesthetics. LOVED, Loved, loved the illustrations in this book...hence the four star rating. The story was entirely too short, but cute nonetheless. This one is very odd.. has themes of "Psycho" throughout.... and ends rather abruptly. twisted humor makes this story of a little boy "trying" to listen to his mom deliciously naughty and fun. This book is funny, great plot, well paced, and awesome. This is an odd but fun little book. The illustrations while computer generated and lovely and add an interesting quality. The story is scant and odd, but the right kind of child will love it. a bit quirky, but may be a silly story for scary story time? "What do I like about writing for children? Everything," says Florence Parry Heide, the award-winning author of more than sixty children’s books, including the classic THE SHRINKING OF TREEHORN, illustrated by Edward Gorey. "I like the connection with children," the author says. "I like the connection with all kinds of book people. And I like the connection with my childhood self, which is the mos "What do I like about writing for children? Everything," says Florence Parry Heide, the award-winning author of more than sixty children’s books, including the classic THE SHRINKING OF TREEHORN, illustrated by Edward Gorey. "I like the connection with children," the author says. "I like the connection with all kinds of book people. And I like the connection with my childhood self, which is the most of me. It is the most welcome and familiar of worlds. There miracles abound--indeed it is magical that something I might think of can be put into words, stories, ideas, and that those words end up in the heads of readers I will never meet." Florence Parry Heide wrote SOME THINGS ARE SCARY, a humorous look at childhood bugaboos, more than thirty years ago. "I had finished another book and was in the mood to write something else," she says. "I decided to get some kindling from the garage, reached into the kindling box and--good grief!--grabbed something soft and mushy. I fled back to the house, scared to death." A brave return visit to the kindling box revealed the object of terror to be nothing more than a discarded wet sponge, but the thought remained: some things are scary. As she recalls, "What scared me as a child was that I’d never learn how to be a real grownup--and the fact is, I never did find out how it goes." One thing Florence Parry Heide does have a good handle on is the concept of friendship, in all its humorous manifestations. THAT’S WHAT FRIENDS ARE FOR, a tongue-in-cheek tale cowritten with Sylvia Van Clief in 1967, pokes at the tendency of well-meaning friends to offer advice instead of help, and presents a valuable lesson about what true friendship means. "One of my many (true) sayings is ‘A new friend is around the corner of every single day,’ " the author declares. "Also true: Friendships last. And last." Born and raised in Pennsylvania, Florence Parry Heide worked in advertising and public relations in New York City before returning to Pittsburgh during World War II. After the war, she and her husband moved to Wisconsin, where they raised five children, two of whom have cowritten critically acclaimed books with their mother. Florence Parry Heide now lives in Wisconsin.